Weight Plates and Barbell Sets are favoured by the most experienced bodybuilders and weightlifters throughout the world over weight machines (such as Multi Gyms or Cable Machines). This is because weight machines are more restrictive. Whilst weight machines are still an important part of any strength training routine, they do not offer the same benefits as free weights. Weight Plates and Barbell Sets incorporate your stabilising muscles to lift weights, making you more effective in producing overall muscular strength and power. In addition, your movements will be more closely matched to your natural motion while the lack of restriction lets you perform a far wider range of exercises. Unlike weight machines, barbells and free weights are also far less expensive and take up less space. Standard Weights: Standard weights are smaller in comparison to Olympic weights and are recommended for the novice/beginner. Standard weights have a 1" diameter hole in the centre of the weight plate. Standard weight plates come in the following sizes: 0.5kg, 1.25kg, 2.5kg, 5kg, 10kg, 15kg, 20kg & 25kg. A standard barbell maximum weight is around 120kg. Once you are lifting near this limit, you will need to consider Olympic weights. Olympic Weights: Olympic weights are larger than standard weights and have a 2" diameter hole in the centre of the weight plate. Olympic weight plates come in the following sizes: 1.25kg, 2.5kg, 5kg, 10kg, 15kg, 20kg, 25kg & 50kg. Olympic weights are better suited for intermediate/advanced strength trainers who are lifting heavier weights than the novice/beginner lifter. Olympic barbells are also stronger than standard barbells with a maximum weight load up to 750kg! 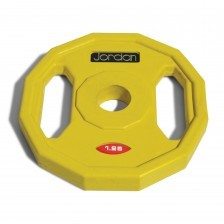 Cast Iron Weights: Cast iron weights are the most popular form of weight plate. Their low manufacturing costs helps keep the price low in comparison to other types of weights. Bumper Grip Weights: Bumper grip weights usually have a 2 or 3 grip design which allows easy transition of the weight. The rim of the weight plate is surrounded by rubber which helps protect the weight from chipping and also reduces the chances of floor surfaces scratching or damaging. 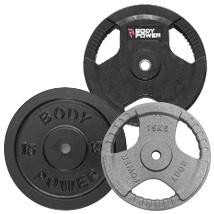 Rubber Encased Weights: Rubber encased weights are cast iron weights that are covered/enclosed by rubber. The rubber coating helps protect the weight from chipping and also reduces the chances of floor surfaces scratching or damaging. 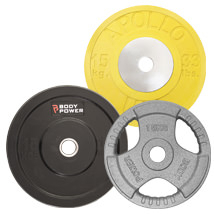 At Fitness Superstore we offer a wide selection of both Standard and Olympic Weight Plates and Bars. 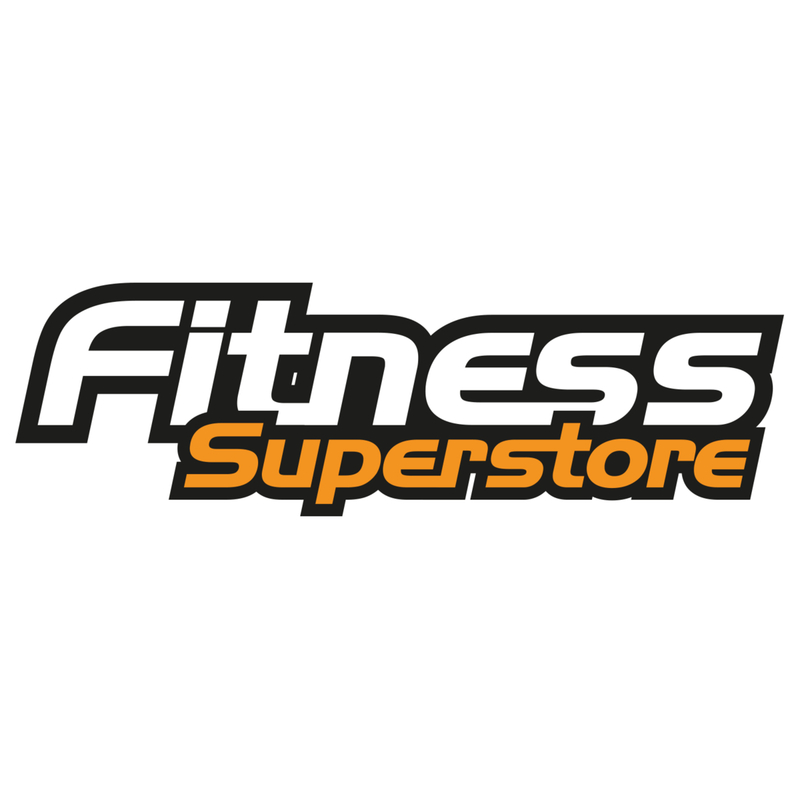 We sell many of the leading brands such as Bodypower, Jordan Fitness, Eleiko and many more.